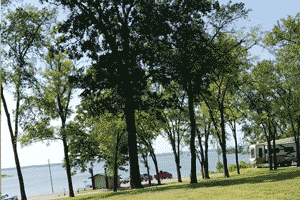 Johnson Creek Campground, a Corps of Engineers managed campground, is located on the east side of Lake Texoma on the Oklahoma side of the lake. Located in the Cross Timbers Region, the campsites are set among post and black jack oaks. The campground is easily accessible off Hwy 70 just west of Mead, Oklahoma. Newberry Creek Marina is about a mile away. Johnson Creek is a very popular campground which offers paved campsites with electrical and water hookups. Sites 1-17, 44, 49, 50 and 52-54 have covered picnic tables. A day-use area with group picnic shelter with electricity is also available. The campground has drinking water, dump station, flush and pit toilets, showers and boat ramp. Johnson Creek Campground Sites 35 through 55 will be open during winter but shower and bathroom facilities will not be available. Individual water hookups will be available until November 1st. During winter months, one frost-free hydrant is available within the campground to fill water tanks; individual water hookups are shut off annually after October. Camping fees are $12.00 per night or $6.00 per night with America the Beautiful Senior/Disability Pass Holders. Please contact the Lake Texoma Project office at 903-465-4990 x 0 for additional information. September 1st through September 30th: All campsites will be available on a first-come, first-served basis (no reservations are accepted). Gate attendants will not be on duty; therefore, camping fees should be paid at the honor vault station located near entrance of park. Camping fees are posted at fee vault station. Restroom and shower facilities will be available during this period. Please contact the Lake Texoma Project office at (903) 465-4990 x 0 for additional information.